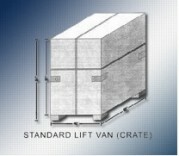 A liftvan is a plywood crate built specifically for international shipments. A standard liftvan is approximately 200 cubic feet (87” high x 87”x long x 48” wide) though liftvans can be made to fit any sized shipment. 1. Where you live in the U.S. Unless otherwise noted, our minimum shipment size is 100 cubic feet. Volume of your shipment, and therefore final charges, are determined based on the outside measurements of the liftvans. INNER DIMENSIONS Length: 5.97 meters 19'7"
DOOR OPENING Height: 2.159 meters 7'1"
OUTER DIMENSIONS Length: 6.096 meters 20'0"
Rates for containers are usually quoted in flat amounts but also may vary based on the actual weight and volume of your shipment – It is important to clarify this at the time you receive your quote. The main disadvantage of containers is that of storage. Since the steamship lines own the containers, we can not hold on to them for more than one week in either the US or at the destination port without incurring charges (approx. $100 – $150 per day). You must be able to ship and receive your container right away. If storage is required, you will need to let us know in advance so we can evaluate your best options.